Please don’t look back at the date on my last post! Just don’t do it! You did….didn’t you? Sigh. Well, all I can say is that it’s been a long year. At last report…..Cannon’s behavior had reached an all-time low. We had had to call in Behavioral Health. It was nothing short of hellacious. For a year. Basically last June to around this June. We worked hard with in-home professional help to get him to a better place. And we did. Over much time, much prayer, and with a whole lotta love…..and strategy. And he was better…..for a few weeks. Then his health went into a complete free fall. And we quickly got back to a place we thought we left behind 3 years ago. A lethargic, sad, hurting mess of a child kind of place. And so it was with a laundry list of symptoms that we walked into the Aerodigestive Clinic last week. Where we see 3 of his docs in succession. Allergist, Pulmonologist, and Gastrointerologist. 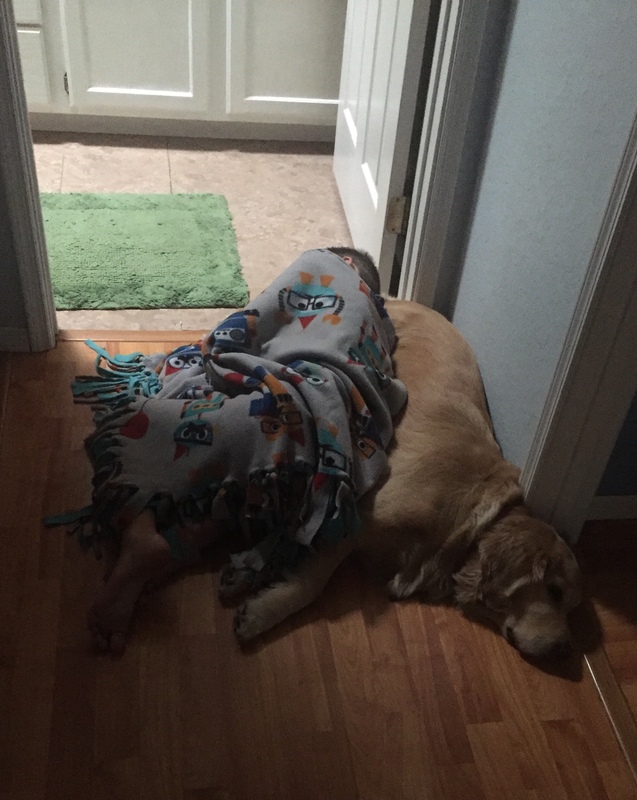 The list included incredibly intense nausea and increased throwing up, sleeping/napping off and on throughout each and every day, his grey color, severe anxiety, this scream and cough mashup thing that he does often and lethargy that is so bad he often can’t walk without assistance….or at all. To name a few. We expected they would decide to scope him and do a Bronchoscopy. Although that solves little…..that is the usual go-to……so it’s what we expected. And we didn’t see coming what was next. Even though it’s been discussed before. His G.I. doc entered the room after consulting with the other 2 docs and delivered the news. We are out of options. There is not one more thing they can do with medication, therapies, tests, etc. Not one more thing. It’s time to put in a feeding tube. Nothing else with do. My sweet baby. My 11 year old. Will no longer eat by mouth. At all. Cannon’s stomach is partially paralyzed. The condition is called Gastroparesis. We’ve known this for 3 years. And because of this….he can’t get the type of feeding tube you may be thinking of. If you’ve seen one before….you have probably seen what’s called a Mic Key. This type of button can be tucked away except for the 3 times a day that you need to run a meal through it. This is NOT the type of button Cannon can get……thanks to his Gastroparesis. If we ran a tube through his stomach…..we would be beating our head against a wall and continuing our current issues. The tube has to run through the jejunem…..a part of the small intestines. Which is not designed to receive a bolus feed. A meal sized feed. It has to drip…..drop by drop…..throughout the course of an entire day. So, he will need a pump…..carried in a backpack…..hooked up to a tube in his stomach……24-7. Deep breath. I have worked so hard for the last 9 years since his problems began to spare him this. SO HARD! We have spared no expense, tried every possible treatment, doctor, theory, and approach. So, I’m incredibly incredibly sad about all he will have to endure. His Autism and Sensory Processing Disorder will complicate this procedure and life after. As well as his comprehension…..which is so limited. Let me tell you the hopeful side of things. Here is what SHOULD happen. This SHOULD improve his nutrition monumentally. This SHOULD help with his malabsorption issue. This SHOULD stop Cannon from refluxing. Which SHOULD prevent him from aspirating his food into his lungs. And the ultimate goal…..is it will give us the CHANCE to change his evil gut flora completely and totally. It is POSSIBLE that he could come off many of his meds. The ones for reflux, chronic bacteria, and yeast are my targets. I say should because if you’ve followed our story for any length of time….you know that Cannon defies odds. His body finds ways to mesmerize doctors. For example…..He is on an INCREDIBLE amount of reflux medication currently. You or I could not be on this much. And yet he still refluxes constantly (We see if every time he is scoped.) and he still has lipid (fat) in his lungs from his food (aka….aspiration). His last test of liquid from his lungs showed it was 50% lipid!!! Mark and I have heard it before. That this would solve all of our problems. So, we are hopeful but not getting our hopes up. If that makes sense. His surgeon was frank with us at our consult this past week. She told me, in her opinion, she didn’t think this feeding tube would ever come out. He will have it for the rest of his life. And she didn’t think they would ever figure his gut out and cure him. Hard…..brutal words to hear……especially before such a drastic step. Those words took me a few days to get over. Maybe I needed to hear them. Maybe they were too harsh. The bottom line is it’s all up in the air. Literally……God only knows. So, how are we doing with this news? I will admit. I’ve handled news better. But I’ve had over a week now and it’s time to pull it together. Getting back into my positive bubble I always talk about. Getting helpful scripture up around the house, my Spirit filled worship music and hymns on repeat all day long, surrounding myself with the love of friends and family, and gaining some perspective. Perspective is always something I harp on. It saves me from the pitiful thoughts my mind can conjure up. It refocuses me and reigns my heart in. The only thing on this earth I have control of is my mind. I try to find both earthly and eternal perspective. The eternal perspective is “obvious.” We are only here for a short time in the grand scheme of things. One day, Cannon will reside in Heaven, with our Lord, where he will be free of the pain and suffering he experienced down here. This week’s earthly perspective came when a friend’s husband posted this photo on Facebook. My first thought upon seeing this was not what most will think when they see it. 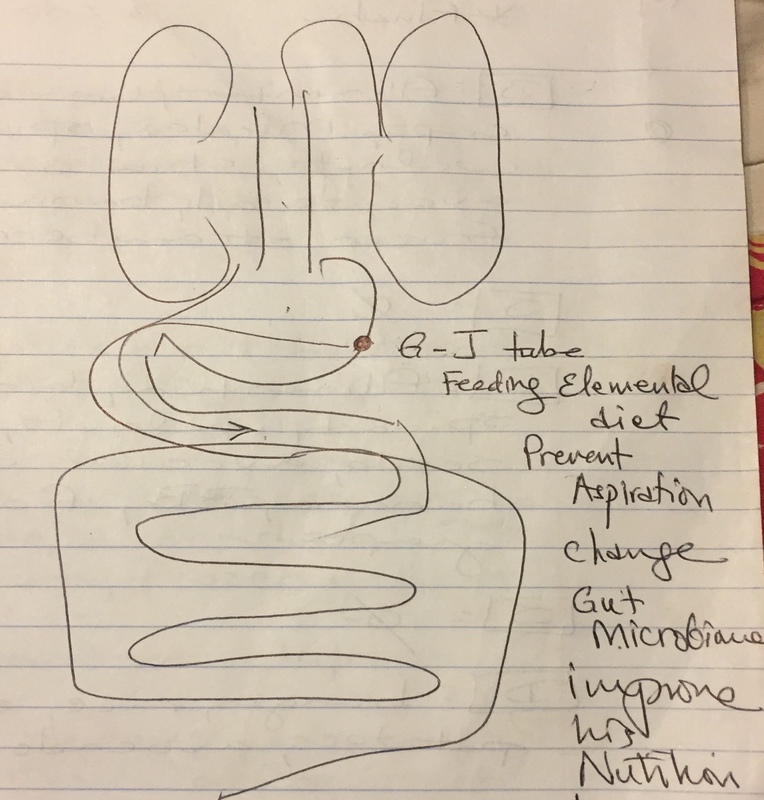 I thought……”Thank you God that my child will have the ABILITY to eat…..thanks to technology.” He has access to the feeding pump, tubing, specialized backpack, and elemental nutrition. Supplies to maintain this device will even be delivered to our home. He has access to doctors to safely and carefully place it….. and advise us on it. Feeding therapists to guide us through the transition. He may eat through a tube…..maybe for the rest of his life…..but it’s a POSSIBILITY. AND….. if he hadn’t had the 9 years of doctors, hospitals, medications, treatments, tests, procedures, and not to mention his Chait Button……would he even still be with us today??? Whoa! That thought hit me hard. Perspective y’all. Perspective. ALWAYS. One of the worst days of our parenting life was the day 6 years ago when Cannon first saw the Chait Button in his abdomen. The sheer terror was almost more than we could bear. We had shielded his eyes prior to that moment in the hospital shower. It was something I hoped to never experience again. I think that is the part of this I dread the most. Him seeing it…. and what it entails for the first time……and watching his new reality sink in. Enduring the inevitable (or so I hear) dislodgings of the tube, leakages, potential allergic reactions, and overall trial and error that goes along with something new like this. Can’t we just press fast forward…..taking us to a time after he has adjusted? Friends……we would be so honored if you could pray for our Cannon. The specific prayer needs are for us to get all the necessary things in place BEFORE he enters the hospital. To have the assurance that specific supplies will be ordered and waiting, feeding therapy approved and ready to start when we are, finding a type of elemental nutrition that he is not allergic to, and a rock star social story waiting to help him comprehend his new life. I am working hard on all of these. But prayer support would be INCREDIBLE! When the thought crosses my mind that “I can’t do this…..it’s too much”……I will think of ….. 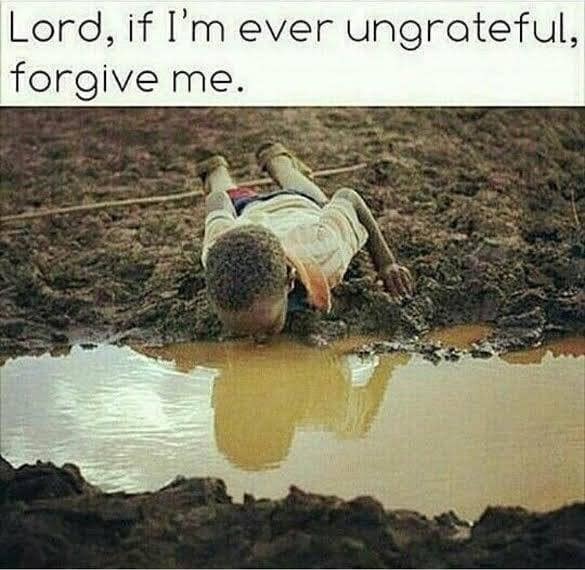 When I hear “He may never eat by mouth again”……I will remind myself……..
Y’all help hold me accountable on this! And please…..adapt them to your own battles and challenges. Remember sweet Cannon in your prayers…..I beg you! And know that we are so very blessed and thankful to you for being a prayer warrior for our family! God bless you!